The trivet CHROMOZONE is both in one: a problem solver and also perfect addition to a table setting. Material mix made of stainless steel combined with coloured silicon. The combination of materials brings colour on the table. Available in four different colours. This modern and elegant two-piece set consists of one high-quality cheese knife and one cleaver.The impressing perforation of each piece makes them a striking feature on any table. 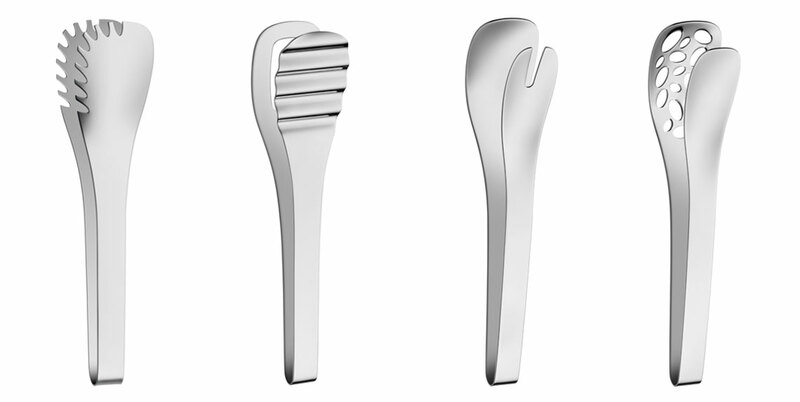 Can be combined with other items of the VELA cutlery line. Development of further parts as an extension of the NUOVA collection. These special parts stand out thanks to their timeless and sleek design. They are suitable for nearly all types of side dishes. The series consists of a perforated serving tong as well as universal tongs and tongs for pasta and asparagus. Made of polished, stainless steel. Smooth lines and wide handles are significant stylistic elements of the cutlery VELA, giving all items a distinctive character and timeless, elegant design. Particularly striking is the extraordinary spoon with a large and almost straight bowl. 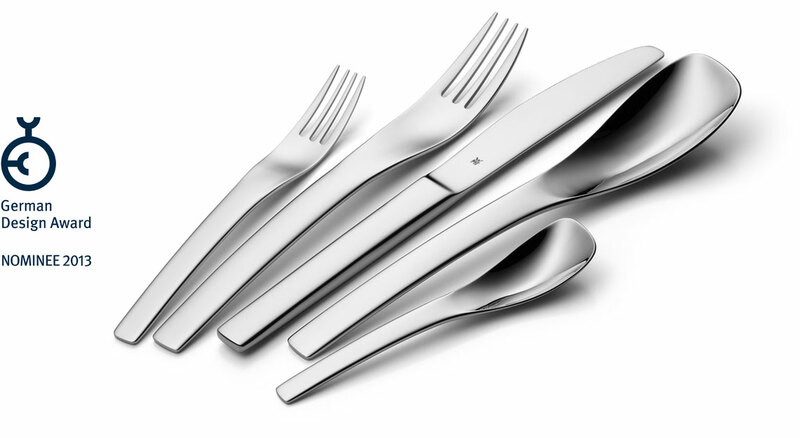 The cutlery range is completed by various serving items. Both elements create a new and state of the art setting of the table. This cutlery range can be completed by various items such as an extraordinary perforated serving spoon, party spoon, salad servers, cake-server, cake fork, fish and steak cutlery, fruit knife, grapefruit and kiwi spoon. As brand new components the VELA series offer rice spoon, fish lifter and lasagne shovel. These bowls can be used to serve accompaniments as desserts like pudding or fruit salad as well as another snacks. Set in modern shapes, suitable for buffet, party and the kitchen. They can be stack on top of one another and are available in four sizes (X/S/M/L). Made of polished stainless steel. These serving pieces meets all your requirements for a classically puristic design and incorporates clear geometric lines into a distinctive ambience. This elegant cake knife and cake server is made of polished stainless steel. These puristic and elegant designed tongs are available in three sizes (S/M/L). For all purposes and convenient to use. The tong S with sharp ends is suitable especially for gherkins, mixed pickles, antipasti as well as ice cubes. The tongs M and L are suitable to serve other types of food. Made of polished stainless steel.